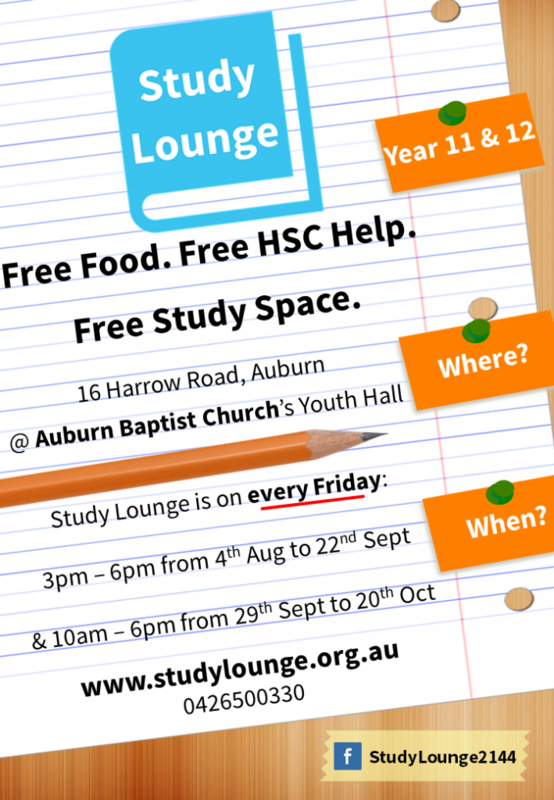 A free HSC Study Lounge for Year 11 & 12 students will be running at Auburn Baptist Church’s Youth Hall starting Friday 4th August. It will be open every Friday 3pm – 6pm providing free afternoon tea, HSC help & resources and quiet study space for students. There will also be volunteers on site to help students with their studies, HSC preparations and provide university admission advice. The HSC Study Lounge is being run because a group of ex-HSC students we are passionate about assisting the community. At “The Study Lounge”, we aim to lessen the levels of distress that students suffer from, and to show them that there is so much more to post high school life than just an ATAR. In late September and early October, there will also be high school teachers running special HSC workshops and free lunch provided for students as well.